Have you longed for brilliant sunshine, soft, warm flat expanses of sand, and the gentle sound of rhythmic waves lapping onto the shore? Then consider taking a trip to Miami Beach soon! This renowned beachfront along South Florida’s stunning Atlantic Coast remains a premiere vacation choice for anyone seeking recuperation and revitalization in a tropical setting. This brief article seeks to describe the beach itself in intimate detail. Yet keep one point in mind: to really appreciate Miami’s acclaimed shoreline, you really need to go there in person. Strolling across the thick carpet of glimmering sand and smelling the crisp saltwater aroma of the beach will give you a vivid, tangible appreciation for the locale. The beauty of this part of Florida attracted attention even during the 1800s. Towards the end of the Nineteenth Century, John Collins (1837-1928) planted avocados on the barrier island. Along with his sons and son-in-law, and several investors, he sought to develop Miami Beach as a resort during the early 1900s. The venture succeeded and, despite a setback when a 1926 hurricane struck the area, people moved in growing numbers into the town of Miami Beach (which had incorporated in 1915). The population expanded further during the booming post-WWII years. Many Cuban refugees emigrated to Miami Beach during the 1960s. The area has continued to attract new residents. The beach in this part of Florida adjoins the City of Miami Beach, a municipality of nearly 92,000 residents spanning a barrier island in far southeastern Miami-Dade County, immediately north of Miami. It includes three distinct beach areas: South Beach, Mid Beach and North Beach. The beach front extends across the eastern shoreline of the barrier island from Collins Park northward towards Alison Park. 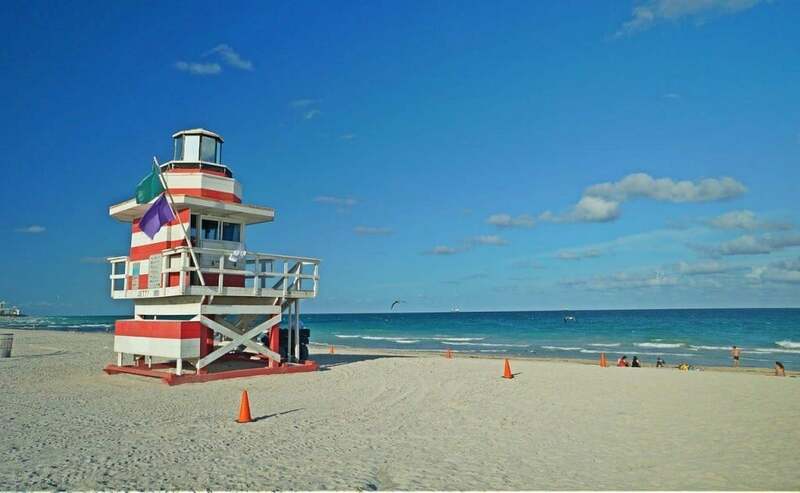 When visiting any of Miami Beach’s Atlantic beaches, you’ll want to consider bringing along any personal items you’ll require, such as towels, sunglasses, hats and sun screen protection. Prepare for a stroll, since the beach front extends well beyond parking areas. One word of caution: jelly fish do frequent the beach, too, so take care to avoid touching them as you walk through the sand or romp in shallow waters. Many residents of South Florida recommend spring and early summer as optimal seasons of year to enjoy beach excursions. Morning offer a particularly invigorating period of the day for this activity. This world-famous beach falls naturally into South Beach, Mid Beach and North Beach divisions. Visitors previously could enjoy a concrete walkway along the southern section, an area marked at the time by plentiful lifeguard towers and many nearby cafes and outdoor bistros. Recent hurricane activity has impacted the beach. As you stroll towards Mid Beach, you’ll still notice plentiful food vendors in good weather, but the size of natural sand dunes in the area increases somewhat. North Beach also offers close proximity to concessions. When weather systems damage facilities such as lifeguard towers in this area, residents rebuild again to ensure comfortable and safe accommodations for visitors. Tourism remains the economic touchstone of this charming community. One thing transient storm systems cannot change (fortunately) relates to the enduring natural beauty of the ocean vistas you’ll appreciate when you visit Miami Beach. Visitors flock to the area to revel in the warm, sandy expanses and magnificent blue water. If you love refreshing warm weather seaside vacations, you won’t want to miss this experience!